Mounting Prints. It is only when prints have been properly trimmed, that we are ready to consider mounting them. There are two distinct kinds of mounts, viz. : commercial mounts that can be obtained ready made from the stock dealers, and artistic mounts, home made combinations of tinted mounting papers or boards. Both kinds are procurable in great variety, to suit all tastes from severe plainness and simplicity to the most artistic creations. However, there are certain general principles that the beginner should always bear in mind to help him in his choice of a mount. Illustration No. 66 Prints of One Size on Mounts of Varying Sizes. Size Of Mount. First, the size of the mount should bear a certain relative proportion to the size of the print. A small print will carry a larger margin, in proportion, than a large print will. Therefore, a small print should have a relatively larger mount, although it should be remembered that a small picture on a large mount will tend to dwarf the apparent size of the print. The proportion of the length and breadth of the mount affects the apparent length and breadth of the print. 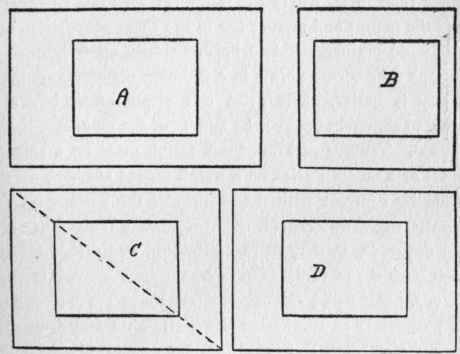 Thus in Illustration 66, A, B, C, D, we have a series of four diagrams where the print remains the same size, but the mounts vary. The best arrangement here is in D. The reader will note that the space above the picture is the same in all four cases. By increasing the end spaces in A the picture looks smaller, but longer than in B, where the mount is very nearly square. In C the mount and picture are in the same proportion, but this is too mathematical to be artistically correct, since it gives us four corner points in a common diagonal. A little variety is better. The print will always look better if mounted somewhat above the middle of the mount. Texture Of Mount. A rough print on a smooth mount or a smooth print on a rough mount are both accentuated by contrast with the texture of the surface on the mount. Great differences, then, of surface texture are seldom desirable, as they attract attention and divide the interest with the picture. Tone And Color. Neutral tones are best where the purpose is to emphasize the high-lights and deep shadows of a picture. But the color of the mount should never so closely approximate the print that it blends with it in any way. The color of the mount should harmonize with the predominant tone in the picture, and this it can do in two ways: First, by harmony of analogy (i. e., a tone of the same or similar color) ; second, by harmony of contrast, where the complimentary color prevails. A suitable mount for any print, then, should either harmonize with its predominant tone or contrast with it along the lines of complement. The first method is the easier for the beginner to follow, because in selecting the mount he simply continues the predominating tone of the print. In this way one avoids such grave errors as mounting prints with purple tones on gray mounts, or black and white prints on brown and green mounts. There are no color contrasts to black and white; each contrasts with the other, and between these are many grays. The beginner, if he is wise, will mount his browns and sepias on mounts that harmonize with these colors - at least until he acquires a good knowledge of complimentary colors. Hence dark mounts in general should be used for deep toned prints and light mounts for delicate tones - but absolutely white or black mounts should rarely be used. Indeed all bright colored mounts are to be avoided, not only because they tend to attract attention away from the picture, but because of the complimentary color suggested. Extremes of color and even texture are not suitable mounts for photographs, as a rule. Quiet or sombre colors of gray-green or brown, also neutral tints are generally most effective. Grays and browns are always useful, and dull prints may often be brightened up by the addition of a narrow white edge around the print. 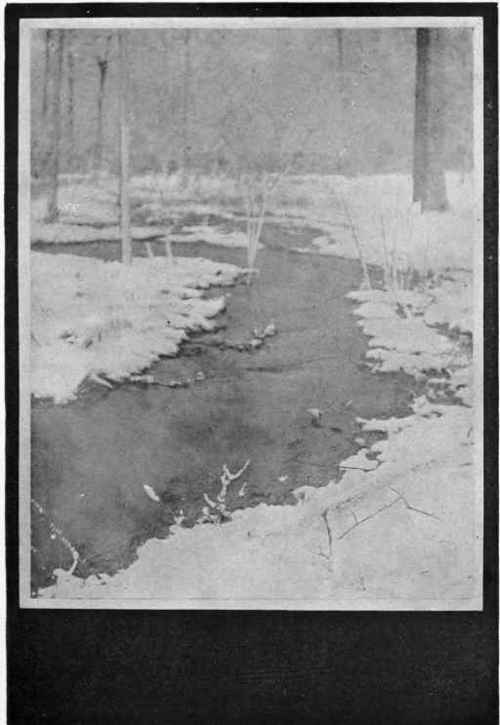 A WINTER STREAM Study No. 10 - See Page 371 By R. E. Weeks.